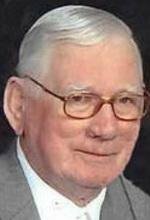 EVANSDALE - Thomas E. Albertson, 83, of Evansdale, died Thursday, Jan. 6, at his winter home in Mesa, Ariz. He was born Jan. 13, 1927, in Blue Earth, Minn., son of Theodore and Irene Brooks Albertson. He married Bessie Grace Bush on May 9, 1955, in San Diego. She died Jan. 30, 1998. He married Stella "Tillie" Smith on Jan. 13, 2001, in Las Vegas. Mr. Albertson was a U.S. Navy veteran of World War II. He was employed at H&W Motor Express as a truck driver, retiring after many years of service. He was a former member of the Elks Club and was involved in many clubs, including Fountain of the Sun Country Club, Martin Lodge, El Kahir Shrine, Apache Junction Legion, Moose Lodge, and was a life member of the Scottish Rite and Evansdale AMVETS Post 31. He attended Prince of Peace Lutheran Church, Evansdale, and Broadway Christian Church, Mesa, Ariz. Survived by his wife; three sons, David P. (Judy) Vance of Waterloo, Robert L. (Linda) Cooley of Waterloo and Thomas W. (Sherry) Albertson of La Porte City; two stepsons, Steven E. (Nadine) Smith of Walker and Douglas W. (Stephanie) Smith of Clive; five grandchildren; a great-grandchild; and two sisters, Doris (Gene) Bard of Waterloo and Shirley (Harold) Begeman of Charles City. Preceded in death by his parents; his stepfather, Wayne C. Smith; a daughter, Michael Renee Albertson; two brothers, Kenneth and Ed; and a sister, Esther Albertson. Services: 10:30 a.m. Friday at Prince of Peace Lutheran Church, Evansdale, with burial in Garden of Memories Cemetery, Waterloo. Military rites will be conducted by Evansdale AMVETS Post 31 and Waterloo AMVETS Post 19. Public visitation from 4 to 7 p.m. Thursday at Parrott & Wood Chapel of Memories, an Overton Family Service, with a 7 p.m. Masonic service. Visitation also an hour before services Friday at the church. Memorials may be directed to Cedar Valley Hospice or El Kahir Shrine Transportation Fund. Thomas will be greatly missed by all who knew him. He enjoyed golfing and bowling.